You’ve spent hours perfecting your hair and makeup before your night out, so of course you want to keep it looking flawless. It’s no mean feat looking and feeling fresh when you’re exposed to the heat of a club or pub, but we have some essential tips and tricks to keep you looking great even if you don’t feel it. 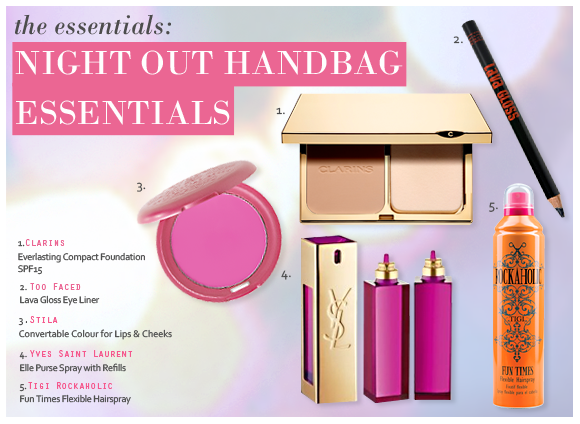 Opt for multi-tasking products that won’t take up much space in your bag, but will provide maximum results. These five products are your new night out saviours..
Rather than lugging your big bottle of liquid foundation around with you, either decant some into a small vial or pot, or plump for a new generation powder foundation. The innovative formulations of these powders are a world away from the chalky makeup of old – they include hydrating ingredients, light optimising complexes and high pigmentation levels for a truly flawless finish. Plus, they have the added benefit of keeping skin feeling matte and fresh for longer than their liquid counterparts, and that’s ideal when there’s dancing to be done. Try: Clarins Everlasting Compact Foundation SPF15, which provides 15 hours of flawless coverage and comes in a beautiful slimline compact. Whether you’re wearing false lashes or you’ve built up an enviable flutter with your arsenal of mascaras, it’s fair to say that your lashes may well be flagging towards the end of the night. Cheat your way to a fully made-up look with a good quality eyeliner that will darken and define the eyes. Tight line the upper lid to simulate a full lash line, and to really add some intensity run the pencil over your water line. When used sparingly, it can also be used to fill in the brows which will further shape the face. Try: Too Faced Lava Gloss Eye Liner, a glossy colour that doesn’t drag across the lids and provides a perfect pigmentation punch. When you’re drinking, eating and talking, it’s inevitable that you’re going to have to reapply your lip colour throughout the night, so aim for a foolproof formula that you can apply quickly and easily. When that formula can be used on both lips and cheeks and it comes in a compact with a mirror, you’re dealing with perfect makeup material! Choose a brightening pink or a radiance enhancing peach to really perk up the complexion. Scent makes you feel more put together, so make sure you always have some to hand for when you’re starting to wane on a night out. A luxurious purse fragrance in particular serves two main purposes on a night out: the first is to revitalise yourself on the go, and the second is to induce a little bit of fragrance envy whenever you take the cute spray out of your bag. Each slimline fragrance is designed to be as durable as they are opulent, so you can rest assured they won’t smash and saturate the inside of your bag with scent. Try: Yves Saint Laurent Elle Eau de Parfum Purse Spray and Refills, a beautiful lipstick-inspired purse spray with a beautiful Peony and Patchouli scent. There are all sorts of things that can make your hair rebel, but humidity is one of the major culprits. Excessive heat and bad weather can make your carefully styled hair fall flat very quickly, so always carry some quick-fix provisions with you. Bobbles and hairspray are a dream team when it comes to sorting out troublesome hair. Tilt your head upside down and spray hairspray onto the roots for lift, and then pull it into a ponytail. It’s out of your face, but still looking glamorous. Try: Tigi Rockaholic Fun Times Flexible Hairspray 75ml, this bag-friendly miniature hairspray has a great scent and is flexible and non-sticky. I was keen to try this, as I have been using the liquid version of Clarins Everlasting for some time. I thought that the compact foundation would be easier to apply and blend. However, despite using a primer it seemed to sit on my skin rather than blend, so on balance I will be continuing to use the liquid version. This entry was posted on Wednesday, January 18th, 2012 at 9:38 am and is filed under Essentials, Fragrance, Haircare, Make-up. You can follow any responses to this entry through the RSS 2.0 feed. You can skip to the end and leave a response. Pinging is currently not allowed.